What better place to visit than the city of the Charminar in the holy month of Ramadan? The heart of the old city, radiating from the four-towered triumphal gateway built in 1591, is a spectacle of all-night shopping and feasting as the crowds pour out after breaking their dawn-to-dusk fasts. Dozens of eateries, large and small, run a roaring trade in purveying dishes of haleem, biryani and kebabs; the lanes are vibrant with traditional trades, such as the old street of bangle-sellers with its mirrored stalls glittering with fake crystals. And nearby, the splendidly restored 18th-century Chowmahalla Palace, where the once-powerful Nizams of Hyderabad were crowned, lived and entertained, draws more than 1,000 visitors a day. Image: A view of the Charminar. 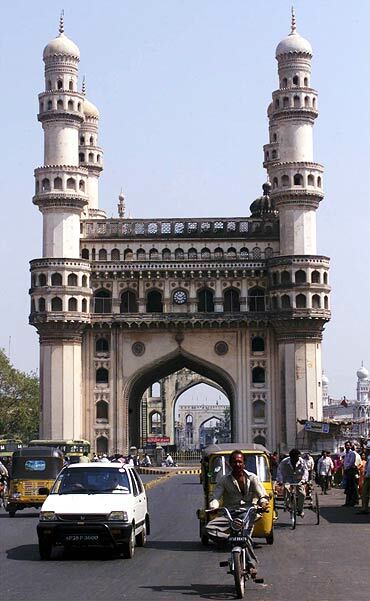 Swelling populations, unplanned growth and creaking infrastructure have taken a terrible toll on many cities, but Hyderabad, for all the depredations wrought by change, manages to retain its alluring attitude of the old and the new in colourful cohabitation. And new Nizams here are to be found aplenty. I spent a morning in Cyberabad, the high-tech city on the northwest perimeter directly linked to the airport by a parallel freeway, and was impressed by its air of confidence and orderly calm. 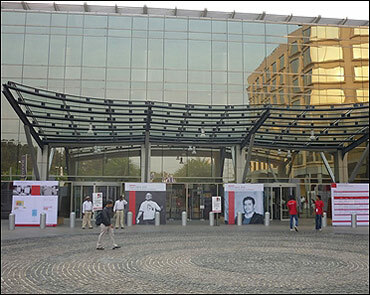 Image: A convention centre in Hyderabad. 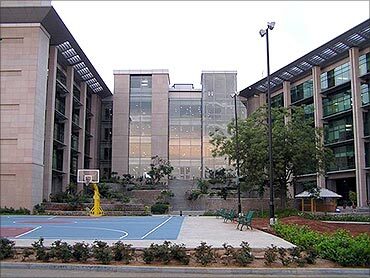 About 100,000 professionals have packed its high- rises and sylvan campuses since the 1990s; at Microsoft's India headquarters, which has grown in strength from 20 employees in 1998 to 1,600 today, Managing Director Amit Chatterjee said: "It's a fantastic city to live and work in. The talent pool is enormous and competitive plus there is Hyderabad's old-world charm." Next door is the 260-acre campus of Indian School of Business set up 10 years ago, with Nizam-worthy endowments, by Indian industry. Competition for its expensive master's programme is fierce - about 570 of 4,000 applicants make it - but it is rated by The Financial Times as the 13th best B-school in the world. It is gearing up to open a new campus in Mohali next year. Ajit Rangnekar, its dean, who came here after living in Hong Kong for 21 years, also extols the city's virtues: "It's an incredibly inviting place." But ISB's purpose is not to create workaday 21st century Nizams, he added. "I have this palace but I don't have the money to be able to subsidise worthy students who will go out and do good rather than produce only good profits." ISB's state-of-the-art architecture was created by the Atlanta-based firm of John Portman. 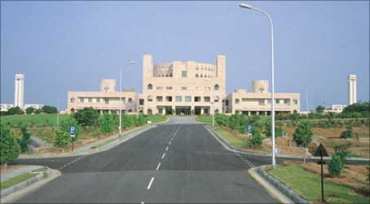 Image: A view of Indian School of Business. Downtown, a more innovative architectural extravaganza opened this year - hotelier Priya Paul's latest 270-room property, designed by the global firm of Skidmore, Owings & Merrill, is a building encased in 6,200 metal panels that light up in shades of amethyst, sapphire and amber at night to reflect in the waters of Hussain Sagar. "My theme was to reinterpret Hyderabad's legendary jewels in cutting-edge architecture and design," she said. To this end, she commissioned top Indian and foreign names in the world of art, fashion and design (that include Subodh Gupta, Tarun Tahiliani, Manish Arora, Conran & Partners and Jean-Francois Lesage) to imagine the hotel's restaurants, nightclubs and luxury suites. Not all the feverish construction is original or sympathetic. 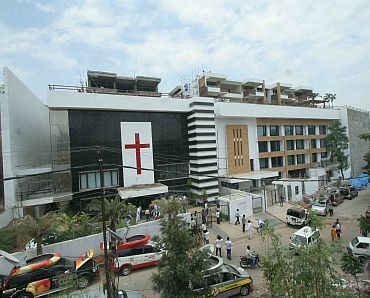 Those who mourn the passing of the city's graceful mansions, gardens and rockscapes point to the palace and church - surmounted by a giant red cross - that Jagan Mohan Reddy, the disgruntled son of the former chief minister had erected in Banjara Hills as his new family home and place of worship. I saw my friend Anvar Ali Khan, one of the city's consummate chroniclers, and asked him where Hyderabad's future lay in the unfinished agitation for a separate Telangana. "You mean what people want here?" he said with a sweeping gesture to indicate the vastness of the fourth largest state in the country. "Only one thing: they all want the keys to Hyderabad." Image: Jagan Mohan Reddy's house in Hyderabad. World's 25 largest consumer markets!